I always think of Rome as being a little selfish, it has so much history, culture and architecture that it can be a little overwhelming to the first time visitor. As the capital of Italy it is home to some 2.7 million people and is located on the Tiber River in the central western region of the country. Rome has a long and illustrious history which spans some two and a half thousand years and the past rulers of Rome contributed much to the rest of the world. The Romans has a major influence in shaping the world as we know it today and spearheaded such initiatives as infrastructure, language architecture, medicine and government among many others. The influence of Rome is echoed around many of the cities in Europe with renaissance styled architecture being one of the most obvious Italian stylistic elements. Rome is without a doubt one of the places you have to visit before you die, but what do you do when you get there? Rome is literally littered with famous monuments and landmarks and to miss them you would have to be wearing a blindfold. 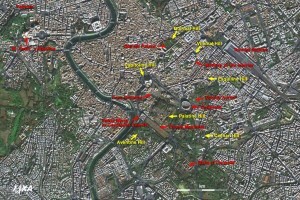 To get you started here are my top 10 sights to see in Rome. 1. The Colosseum – You all knew it was coming and you’re right, it’s the most famous and obvious landmark in the city, so obviously it was going to be number one. 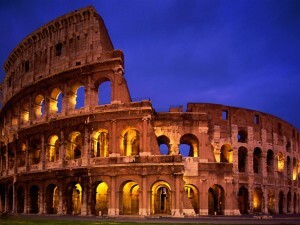 It is an iconic building and represents the Roman Empire to many people around the globe. 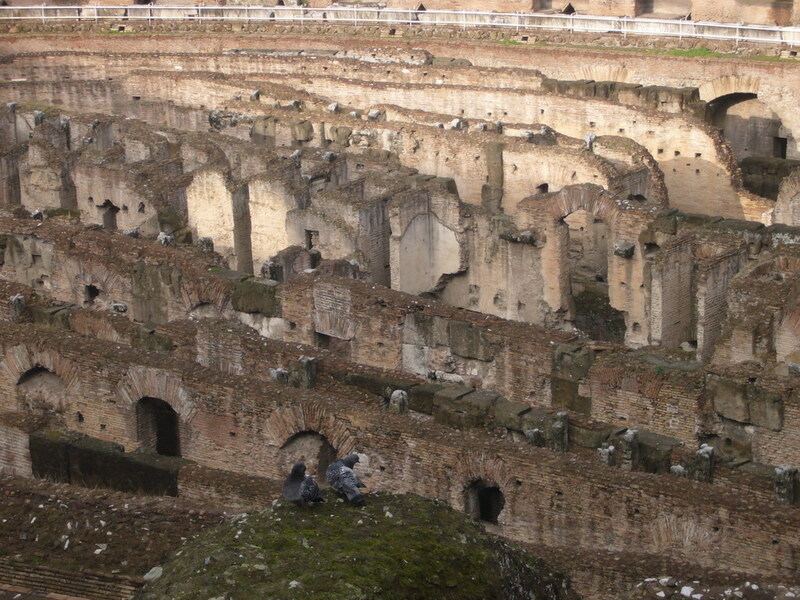 The best way to see the Colosseum is to buy tickets in advance or from the Palatine Hill just next door and take the internal and external tours for the full experience. 2. 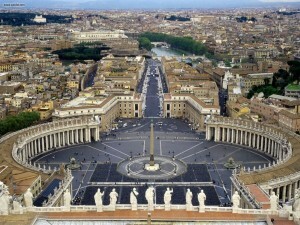 Vatican City – Strictly speaking Vatican City isn’t in Roma and actually forms its own sovereign city state. Never the less it’s in the list as the Vatican is an amazing place to visit. You don’t have to be religious to appreciate the scale and fantastic architecture on display. Vatican City is also home to St. Peters Basilica, the Vatican Museum and the Sistine Chapel so there is a lot of ground to cover if you want to see the whole lot. 3. 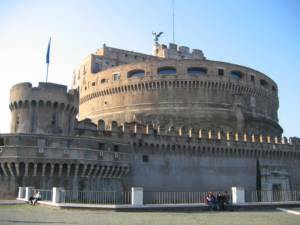 Castel Sant’Angelo – Just East of Vatican City is the Castle Sant’Angelo. This magnificent circular building has to be one of the most imposing in the city and has had a turbulent history. Currently the building is a national museum but in the past it has served as a military barracks, fortress, military prison, papal residence and was once part of the city wall. Situated right on the bank of the Tiber River, it’s easy to find and offers a great insight into Rome’s past. 4. 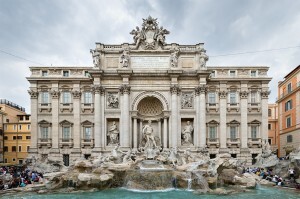 Trevi Fountain – The Trevi Fountain is yet another of Rome’s popular tourist traps and rightly so. It is by far the most spectacular fountain in Rome and is fed by the Aqua Virgo aqueduct. Tradition is to face away from the fountain and toss a coin over your back and into the water. Legend has it you will return to Rome. If you don’t do this then the Trevi Fountain is a great place to sit and people watch. 5. 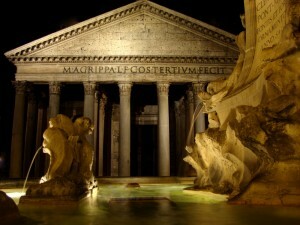 Pantheon – The Pantheon is perhaps as close to ancient Rome as you are going to get today. Build by Hardin as a temple to pagan gods, the building now surves as a Catholic Church and contains the tombs of numerous Italian kings and the artist and architect Raphael. The marble floor remains the ancient roman original. 6. 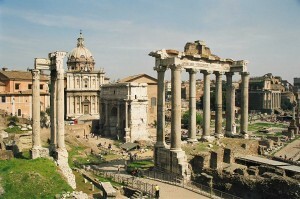 Roman Forum – The Roman Forum was once the centre of life in Imperial Rome and evidence of this can be found in the numerous arches and temples. Traditionally the Forum would have been home to victory precessions, elections and it was where the senate would have been assembles. The site has been ravaged by the effects of time and today a little imagination is needed to appreciate the full scale of what would have been there. 7. 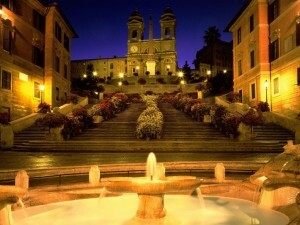 Spanish Steps – The Spanish Steps is another of the most popular tourist attractions in Rome and as a result, you may choose not to visit the area. If you do the best time of year to go is in May when part of the steps will be covered by pots of azaleas. Bizarrely, Roman urban regulations forbid anyone from eating lunch on the steps. 8. Catacombs of Rome – There are at least 40 catacombs in and around Rome and although it won’t be for everyone, they show visitors how burial for early Christians, Pagans and Jews in Rome worked. 9. The Seven Hills of Rome – For those who don’t know, Rome was build on 7 hills, originally the seven hills were first occupied by settlements which weren’t grouped. The residents would participate in various religious games and a bong was formed between the settlements. Eventually the marshy land between the hills was drained and the settlements expanded into one single city. Of the seven hills the most popular to visit are the Capitoline Hill and the Palatine hill. 10. 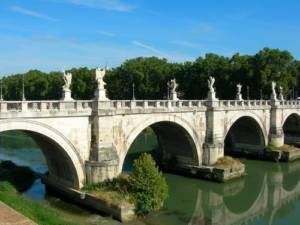 Ponte Sant’Angelo – Also known as the Angel’s Bridge, this historic bridge has been crossing the river Tiber in various forms for almost two thousand years. Located just outside the Castel Sant’Angelo and crossing the Tiber River, the bridge is famed for its 10 statues of angels. Today the bridge is used solely for pedestrian traffic and so provides excellent photographic opportunities. Alex is a freelance internet marketer and copywriter working a company that specialises in tailor made holidays. You can find him on Twitter here @ harvey1dash8.